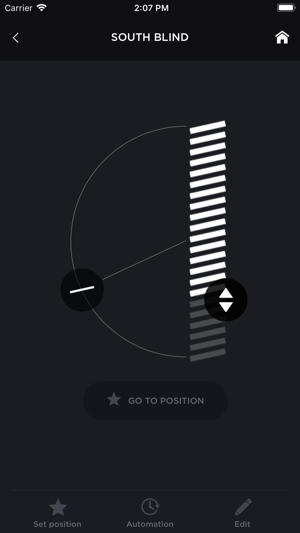 Connecting your Copenhagen Blinds by Art Andersen CPH to the app turns your iPhone/iPad into a remote control. You can now raise, lower and tilt your Blinds, and you can even schedule your Blinds to secure optimal indoor climate. Venetian Blinds is an ancient invention and not a lot has happened the last few hundred years. No product development, no new technology, just the same principal. However, Venetian Blinds are still pretty genius. They can control how much light you get; they can soften the light and prevent people from looking in. They can hinder the damaging UV beams from the sun light. But the old construction of Venetian Blinds does have disadvantages too. The slats do not blacken entirely, and the holes in the slats will always let in sunlight. And as we all know Venetian Blinds are difficult to clean! Art Andersen of Copenhagen, has worked professionally with sun shading for over 35 years, and they have now successfully re-invented and re-designed the blinds. 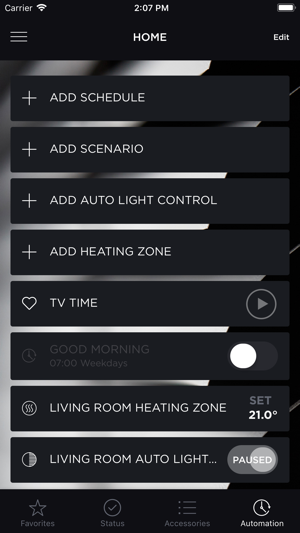 - Smart Heating Zones. A Heating Zone is a collection of Danfoss thermostats and door/window sensors. The thermostat temperature is controlled by the Heating Zone. 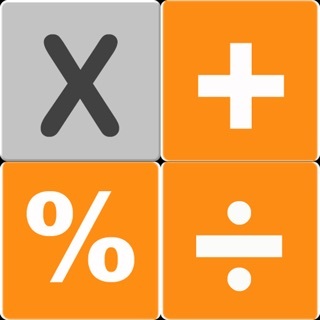 If any door/window in the Heating Zone is opened, the temperature is automatically lowered to save energy. 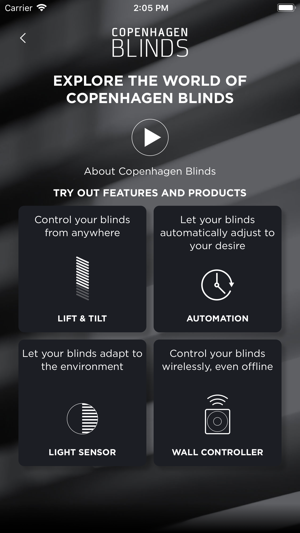 Get more information and purchase the Copenhagen Blinds on www.byArtAndersenCPH.com. You can now change password in profile page. 2. Meget upraktisk at man ikke kan tilføje grupper til et scenarie. 3. Tilføj scenarie mv under automation bør ikke fylde hele toppen. Man skal scrolle ned hver gang man kommer ind ind på siden. Der er kun når man opsætter at det er nødvendigt at tilføje. 4. En hel side hvor der bare vises om alt er ok er lidt overflødig, send en push eller vis side hvis noget er mangler..
Ellers et fint produkt, men der skal tænkes mere i daglig brug...det er meget fokuseret på opsætning hvilket jo kun er første gang. 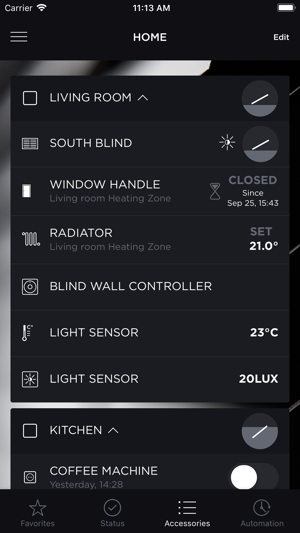 With the app we can control our blinds from anywhere and the blinds can be scheduled, which is a really great feature. I like the intuitive interface! Works great on my iPhone 6. Endelig en intelligent og flot gardinløsning. Jeg er så glad for at jeg fandt dem til mit nye hus! Det virker bare! !